Long queues outside counters are often a nuisance. Improper management of queues can cause frustration among customers as well as the staff. Customers getting into fights between themselves and the staff are also quite common. Queue Management System (QMS) can help you avoid these unpleasant situations by providing quality solutions to effectively manage queues. Queue Management System (QMS) runs on a parallel architecture that connects the TCP/IP Network with the ticket terminal, Queue Server, Media Player and Virtual terminals. Integrated with the SMS solution, our Queue Management System (QMS) can keep the customers informed regarding their appointments, queues and schedules. Fully customizable and editable touch screen ticket dispenser. Virtual terminal with counter login and logout. Digital voice on calling number and repeated calls. Repeated calls and Store & Recall of missed numbers. Counter selects the task to serve. 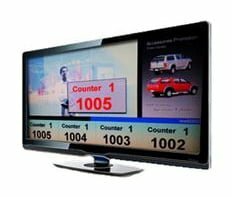 Unlimited number of LCD displays with dedicated space for advertisement content.